Actress/singer Rajane Katurah Brown didn’t know what to say or what to do with her hands. She confessed Sunday night at the Dakota that she’s not accustomed to appearing onstage without a script or choreography. “I’m not a talker, I’m a singer” she explained. Not to worry. She had singer/actress Jamecia Bennett with her. Bennett has the personality, pizazz and powerful pipes to fill an arena, let alone an intimate club like the Dakota. Bennett doesn’t need any choreography, script or wardrobe stylist. 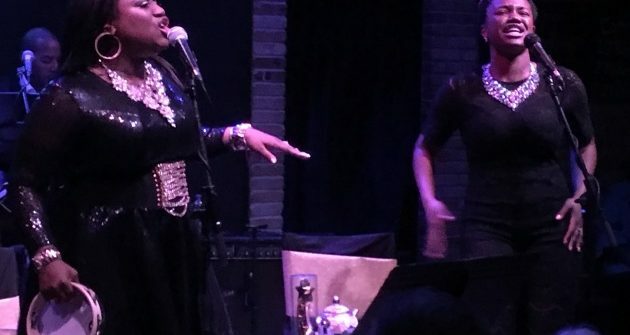 But Bennett and Brown had an outline for their performance Sunday – a program honoring their recent triumphant Park Square Theatre play “Marie and Rosetta” about gospel shouter-turned-rock ‘n’ roll godmother Sister Rosetta Tharpe and her young protégé, Marie Knight. Sunday’s two-set revue – featuring a taste of dialog from the one-act play set in 1946 – was as exciting as the production at Park Square. After several recordings by Tharpe were broadcast, the program began with each singer/actress telling a bit about themselves. Brown is the oldest of six children from Bridgeport, Conn. She graduated from Spelman College in 2017, then came to the Twin Cities as an apprentice at Children’s Theatre and joined the company at Children’s last fall. Bennett is the lead singer of the Grammy-winning Sounds of Blackness (taking over for her mother, Ann Nesby), and she has appeared in shows at Penumbra, Mixed Blood and Children’s Theatre. She is the mother of “American Idol” finalist Paris Bennett. The veteran unleashed her deep, resonant, soul-stirring voice on the opening “This Train,” one of Tharpe’s best known numbers, dating to 1939. As became clear throughout the evening, Brown, like Knight, comes from church music, and Bennett, like Tharpe, knows how to boogie and move her hips.That was a running joke in the play as well as Sunday night. Bennett has a robust, bravura voice, while Brown is somewhat delicate by comparison, sounding young but heartfelt. The set list drew heavily from the play, with Thomas Dorsey-penned gospel standards, Tharpe originals and “Amazing Grace,” added for good measure. In “Marie and Rosetta,” the actresses mimed playing piano and guitar. At the Dakota, there were no such theatrical tricks. The musicians who backed them were not hidden behind a scrim this time: Michael May on guitar and bandleader Natalia Peterson on grand piano. With his quick solos, May proved something that musical director Gary Hines pointed out in his introduction to Sunday’s concert: That signature guitar riff that you think of as Chuck Berry’s actually came from Rosetta Tharpe, who was inducted into the Rock and Roll Hall of Fame in 2018. Bennett certainly had a signature moment Sunday, sitting down and taking Tharpe’s blues “I Looked Down the Line” to church, unearthing her magnificently rangy voice with thunderous, guttural screams of testimony. The singer was shaking afterward as the audience gave her a rousing standing ovation that lasted so long that it had two crescendos. The performance by Bennett and Brown more than made up for anyone who missed church on Sunday morning. And it, like Thomasina Petrus’ work with Billie Holiday shows at the Jungle Theater and the Dakota last year, demonstrated that so many singing actresses in the Twin Cities deserve to be heard regularly in concert settings.